F or many people the familiar story of America in the Roaring Twenties is that of The Great Gatsby, the Harlem Renaissance and the Machine Age; while the 1930s are known as the ‘Steinbeckian world’ as marked by the Great Depression and New Deal. The Ashmolean’s latest exhibition however dispels these images with a display that brilliantly focuses on a prevalent style of interwar American art which has sadly been forgotten. The Ashmolean’s latest groundbreaking exhibition aims to showcase major works by American artists who have largely been forgotten. 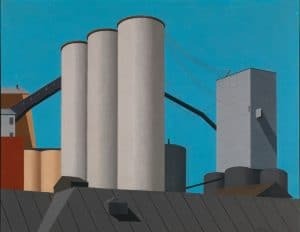 America’s Cool Modernism: O’Keeffe to Hopper (until 22 July 2018) boasts over 80 paintings, photographs and prints from international collections, as well as the first American avant-garde film, Manhatta. Cool Modernism examines famous painters and photographers of the 1920s and ‘30s with early works by Georgia O’Keeffe; photographs by Alfred Stieglitz, Paul Strand and Edward Weston; and cityscapes by Edward Hopper. It also displays the pioneers of modern American art whose work is less well-known in the UK – particularly Charles Demuth (1883–1935) and Charles Sheeler (1883–1965). It includes Demuth’s iconic I Saw the Figure 5 in Gold (1928), the painting Robert Hughes described as the “one picture so famous that practically every American who looks at art knows it”. Dedicated to the poet William Carlos Williams, Figure 5 was one of a series of symbolist poster portraits which Demuth made of friends and fellow artists. 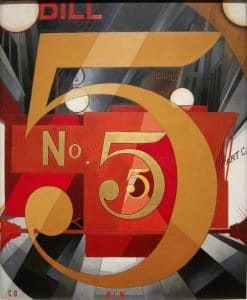 Consisting of an enormous stylized ‘5’ that occupies the entire picture plane, and painted in bold colours on wallboard, the painting evokes new styles of advertising that were multiplying in American cities in the 1920s – a remarkable anticipation in fact of the pop art which later became fashionable during the fifties and sixties. Another important loan is Sheeler’s Americana (1931) which has never before been lent outside the USA. The painting shows a traditional American domestic scene with Shaker furniture and folk objects arranged in a near abstract composition – a blend of modernist forms with a historical subject. The exhibition focuses on those artists who grappled with modern America via a very cool, controlled detachment, even eliminating people from their pictures. For some this treatment reflected an ambivalence and anxiety about the modern world. Factories without workers and streets without people could seem strange and empty places. Two works by Jacob Lawrence (1917-2000) from his Migration series, which is otherwise full of characters, are notable for their absence of people. They express the harsh experience of African Americans travelling north in hope of a better life (although what they found was, more often than not, frightening rather than promising). Likewise Edward Hopper’s Manhattan Bridge Loop (1928) features a gloomy atmosphere with a tiny, solitary pedestrian whose walking pace is at odds with the bridge’s traffic. For others, this cool treatment of contemporary America was a positive response – an expression of optimism and pride. Skyscrapers and bridges became studies in geometry and cities were cleansed and ordered with no crowds and no chaos. Louis Lozowick’s (1892-1973) prints capture the energy of the city in curving sprawls and buildings soaring into the sky; while Ralston Crawford (1906–78) and Charles Sheeler depict the architecture of industrial America – factories, grain elevators, water plants – as the country’s new cathedrals, glorious in their scale and feats of engineering yet oddly emptied of people. 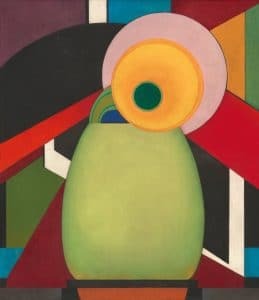 These artists were also engaged in a conscious effort to develop a distinctly American modernism, not derived from Europe but rooted in the American cultural tradition and landscape. They drew a direct line of descent from the simple utilitarian forms of Shaker furniture and rural barns to the standardised, machine-made world of the 1920s and ‘30s. In painting and photographing these subjects in a commensurate style (crisp surfaces, flattened perspective, linear purity), artists and critics were revealing an essential attribute of the American character – modernity. The exhibition, which runs until 22 July, is organised by the Ashmolean and the Terra Foundation for American Art and is curated by Dr Katherine Bourguignon of the Terra Foundation and Dr Xa Sturgis, director of the museum. In May 2018 the Ashmolean and Blackwell’s bookshop have planned a month-long festival celebrating American culture of the 1920s–40s. The programme includes the American LiveFriday on 25 May: an ‘American Lates’ series where you can enjoy the exhibition, listen to music, and drink 1920s inspired cocktails; a film series with the Curzon Cinema; talks and performances at Oxford Playhouse; and an American literature display at Blackwell’s – where artworks in the exhibition are matched with great American writing of the period.